Speech by Thor Sigfusson at North Atlantic Seafood Forum – Bio Marine in oslo, March 6th, 2012. 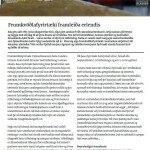 In recent years, both industry and governments in the Nordic countries have shown interest in utilizing the whole fish catch. The stakes are high. Of around 7 million tonnes of fish catch of smaller North Atlantic nations up to 50-60% of the fish may end up as rest raw materials. We could therefore estimate that at least over 3.5 million tonnes of North Atlantic fish end up as rest material. In many ways, Iceland can be looked upon as an example of how to treat rest raw material. Iceland enjoys a higher price for its fish than most countries and has a long and growing tradition in treating rest raw material. There are three main reasons for the interest in rest raw materials in Iceland; Economics, Market systems and Culture. All these three terms play a role in the success of the treatment of rest raw materials in Iceland and can become a part of policies and policy implementation in other countries. The economic issue is key here. There needs to be an incentive in the system to use rest raw materials. The fisheries system needs to reflect sensible management of rest raw material. This is not only a matter of the fisheries system but also economic incentives for the fishermen themselves. Early on Icelandic fishermen were allowed to collect rest raw material on board ships which they collectively sold and benefited from. By that the fishermen have for a very long time been involved with collecting rest raw materials and seen value in „waste“. There also needs to be a market and market channels for rest raw material. Many of the seafood tradere in Iceland have a long standing relationships with their global clients. The recent development of domsetic industries focusing on rest raw material has also led to more specialisation and market innovation. This large network of marketing activities means that the rest raw material in Iceland has various access routes in the global market. Even though business and markets are important we still need to enhance a culture for appreciating the opportunities in the bio-marine sector. Young people have for a long time shown interest in fisheries in Iceland which has been a part of our success. In recent years we have seen drops in admissions for bio-marine and other marine focused education. 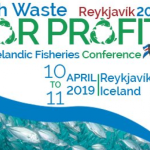 One of the Iceland Ocean Cluster aims is to initiate a public awareness programme with a mission to increase the interest in the bio marine sector. If we are not able to grab the attention of young people we will not succeed in developing a large industry in the bio-marine economy in the future. 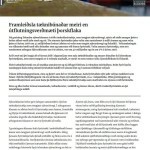 In recent years, both industry and Governments in the Nordic countries have shown interest in utilizing the whole fish catch. Projects are initiated in the Nordic countries which emphasise on rest raw materials; from various entrepreneurial activities in this field, research projects such as in Denmark with a project called „trash2cash“ to massive research projects financed by Nordic Innovation on rest raw materials. The stakes are high. Of around 7 million tonnes of fish catch of smaller North Atlantic nations up to 50-60% of the fish may end up as rest raw materials. We could therefore estimate that at least over 3.5 million tonnes of North Atlantic fish end up as rest material. We actually have very limited knowledge about how much rest raw material is processed and how much is discarded. Obviously this limits very much possibilities to actually assess the the amount of discarded resources. There are various reasons for discarding of fish and fish raw material. Fish is of the wrong species, wrong size, the fish can be damaged, there is lack of space on board, the boat‘s quotas are reached simply or the species have a low commercial value. It is interesting to compare the Nordics to some of our other European counterparts in respect to discarding. Firstly the terms is used somewhat differently. In the heavy-regulated EU waters the term „discarding“ is first and foremost used to describe the huge issue of throwing fish over board. According to a recent study by the New Economic Foundation, UK fishing crews have thrown away stocks of cod worth about £1bn since 1963 due to the practice of discarding catches which exceed or fall outside quotas. Across all EU fleets, stocks of cod worth £2.7bn were discarded in the North Sea, the Channel and Skagerrak, the strait adjoining Norway, Sweden and the north of Denmark between 1963 and 2008. Just over 2.1m tonnes of Cod was thrown overboard during the period. The Icelandic quota fisheries management system and increased awareness has partly at least led to a better handling of fish and the same can be said about the nordic countries. The term „discarding“ as used in the Nordic countries has therefore been focused on „discarding“ of rest raw material. Even though there is lack of statistics regarding discarding of rest raw material we have indications that huge sums are wasted and we are foregoing great opportunities for value creation in the North Atlantic area. Iceland can be looked upon as an example of how to treat rest raw material. 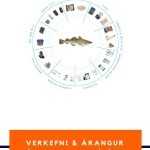 I will now turn to the Icelandic lessons whith a particular focus on the Icelandic Cod for simplification. Iceland has enjoyed a higher value for fish products than most of the countries we compare ourselves with. Exports of Cod heads, bones etc. from Iceland indicate also a higher proportion of usage of these rest material than in most countries we compare with. Iceland has also a number of firms specializing in further utilisation of rest raw material. There are three main reasons for the interest in rest raw materials from the Cod in Iceland; Economics, Market systems and Culture. All these three terms play a role in the success of the treatment of rest raw materials in Iceland and can become a part of policies and policy implementation in other countries. All these three terms play a role in the success of the treatment of rest raw materials from Cod in Iceland and can become a part of policies and policy implementation in other countries. The economic issue is key here. An underlying thread is that all indications are that rest raw material – in other words wild seafood protein from sustainable fisheries – will become more valuable resource. The caught amount of this wild protein is not increasing but the demand can increase significantly in the coming years. The fisheries system needs to reflect sensible management of rest raw material. 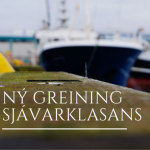 It is my firm believe that the Icelandic transferable quota system has been a major influential factor in better management of fishing resources – from fishing to full processing. But it is more to this than the fisheries system. Economic incentives for the fishermen themselves are very important. Early on Icelandic fishermen were encouraged to collect rest raw material on board ships which they collectively sold and benefited from. By that the fishermen have for a very long time been involved with collecting rest raw materials and seen value in „waste“. When discussing the utilisation of rest raw materials with Icelandic fishermen many have already been actively seeking ways to create value from the rest raw material. Partly this may be explained by patriotism, professionalism etc., but I believe the main reason is that there is often good business in the rest raw material. For a long period of time the fishermen have gained from better treatment of fish on board. In my research I have noted that the reason why Iceland has over 60 technology firms providing technology for fishing and fish processing is that the demand inthe fisheries sector in Iceland for quality is high. Such demand does not come naturally but as a result of a sensible incentive scheme. One entrepreneur with a successful cooling technology firm in Iceland told me that as soon as he had developed his new cooling equipment in the 90‘s he visited a large fisheries company in Iceland. He introduced them to his new technology where the temperature management of the fish could, as he emphasised, be improved significantly. The fishermen and the skipper wanted to test the equipment and they later became the first customers. This same tech entrepreneur took his equipment to other countries and the response was frequently „What we have is good enough“. There were no incentives to improve quality – less incentives to bring a higher standard of fish to the market! The same has been the case with discarded materials in Iceland. For long the fishermen were allowed to collect rest raw material on board ships, they collective sold the material and used the funds for special events, travels etc. By that the fishermen have for a very long time been involved with rest raw materials and seen value in them. 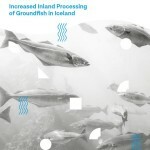 This interest meant also that researchers in rest raw material have for long had good cooperation with fisheries regarding rest raw material and this cooperation between for instance Matis, the Icelandic leader in food research, and industry has played an important role in this development. Now, many fisheries pay a high portion of the value of rest raw materials to the fishermen but the calculation may need to be changed from the old models. Both need to benefit, particularly as the vessels need to invest in new technology to treat various rest raw materials. This is an issue of economics – a very important issue which fisheries need to address in good cooperation with the fishermen. I know Oystein Lie has been interested in calling the ocean bio-tech sector the bio-marine economy. I believe the word economy reflects very well the often missing piece; it is an economic issue to discard and we need to show that the bio-marine sector means business. As a side note, we could and should explore the possibilities to use the same incentive scheme to save energy on board vessels and even fishing gear. A good economic incentive programme for the skipper and fishermen could be interesting to explore and could lead to value creation and improve the environment. The issue of market is very important regarding rest raw materials. Existing market, market channels etc. are part of the business decision to discard. Many of the smaller fish sales- and marketing firms in Iceland have a long standing relationships with their clients around the world and many are trading with fish which never has been to Iceland or Iceland waters. The development of domestic industries focusing on rest raw material has also led to more specialisation and market innovation. This large network of marketing activities means that the rest raw material in Iceland has various access routes in the global market. We still have a large challenge here and a threshold. All the firms selling rest raw materials have mainly been in the seafood market so knowledge about other markets are very limited. To sell plasters from rod, skin and body formulas from Cod enzymes, etc. takes a different team of marketing experts and that is what I consider our greatest challenge for the products at the highest end of the Cod‘s value chain. 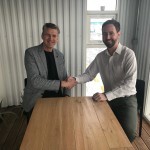 The Iceland Ocean Cluster has initiated with other Nordic and Canadian cluster experts a programme which aims to increase cooperation among marine clusters in the North Atlantic. This project is partly sponsored by NORA and Nordic Innovation. We determined to find the so called low hanging fruits in our project; work which could be initiated soon in the process. One of these low hanging fruits is to map the work being done in fisheries clusters and industries around the North Atlantic. Our dream is to map the whole network of key players in this field and get them to know each other, share ideas and create a more dynamic market for rest raw materials in the North Atlantic. Even though business and markets are important we still need to enhance a culture for appreciating the opportunities in the bio-marine sector. With a greater understanding comes also more appreciation of research in this area which is vital to the future of the bio-marine sector. As many countries with abundance of natural resources there is still work to do in Iceland regarding for instance the understanding of the value in investing in research and development in this field. Young people have for a long time shown interest in fisheries in Iceland which has been a part of our success. In recent years we have seen drops in admissions for bio-marine and other marine focused education. 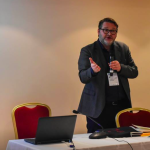 One of the Iceland Ocean Cluster aims is to initiate a public awareness programme with a mission to increase the interest in the bio marine sector. If we are not able to grab the attention of young people we will not succeed in developing a large industry in the bio-marine economy in the future. We are worried how few young people see opportunities in the ocean and new fields within the ocean cluster. We want to change that. In the awareness programme we will show how new products are being developed and these products will be developed by well trained and educated people. High quality fish leather used for shoe- & clothing production and more (Atlantic Leather Ltd.). Marine-derived tissue regeneration product (Kerecis Ltd.). Cosmetics made from enzymes from inner organs. (Zymetech Ltd.). Canned products made from cod liver ((Akraborg, Ice-West, MC09 etc.). Many of these firms have been collaborating with fisheries and fishing vessel owners are also part owners of these companies which has been very valuable for these small ventures as they have opened channels for financing, managment experience etc. These firms together can lead to a significant value creation for the fisheries industry. The mission here should be to get for each Cod at 30-40% higher value than the current value of each caught fish. For Iceland, this could mean an added export value for the economy of at least 6-700 million euros. In our preliminary work regarding strengthening the network among people in the rest raw business in the North Atlantic we have seen a gap. People have very limited information about who is doing what and how? Projects sponosored by NORA and Nordic Innovation and prior research funds have significantly increased the awareness of individual projects but overall picture does not exist. In our research project which aims at linking people in the rest raw material business together, we have already come across interesting entreprises in the Faroe Islands, New Foundland, Denmark, Sweden, Iceland and of course Norway. Many of them know little of each other. Our mission is to link these industries and entreprises together and use the concept above to study how to enhance the bio-marine market. This Bio-marine conference by MareLife is therefore a very important initiative and a tool to connect people in the bio-marine economy. I would therefore like to end by congratulating MareLife for this initiative and leadership in bringing the bio-marine sector together.